My generation rubbed holes in the bottoms of our Weejuns, dancing to the tunes you’d expect from a black band. As we slid our leather-soled shoes across the terrazzo floor of Cracker Williams Recreation Center, we knew our friends—King David and The Slaves—were going somewhere. They became a mainstay on fraternity row at the University of Georgia and college campuses across the South. Jekyll Island’s Aquarama was another popular venue. Once, the group opened for the Drifters at Vanderbilt University. Myrtle Beach, the shag mecca of the Eastern Seaboard, loved King David and The Slaves. A regular gig for the Jesup group was warming up for famous acts, such as the Tams, the Platters, Jerry Butler, Clifford Curry, the Dells and “Mr. Excitement,” Jackie Wilson. Today, there are more than holes in my generation’s penny loafers. The death of “King” David Harris, 71, has ripped holes in our souls. Without warning, a heart attack claimed the life of the band’s namesake and one of its founders. Days earlier, David had been skydiving and basking in the joy of being “Papa” to his grandkids. In elementary school, I walked by the Harris home on my way to Orange Street Elementary. The living room of John Henry and Ida Harris is where the band was born. Years later, David would marry Stacy, daughter of Orange Street’s principal, Tom James. Band members came and went. Lee Riggins, a classmate of mine and Randall’s, was the original keyboardist. The future classical pianist talked his mother, Gladys, into letting him trade his Chickering baby grand for a Farfisa organ, which could be played through David’s Fender amplifier. Butch Peede would eventually take Lee’s place. And when David joined the Army, Wayne Scarborough came in, playing bass guitar. The early brass section was Randy Replogle on saxophone, with Russell Martin and Eddie Peede on trumpet. There were three sets of brothers in the band: David and Moi, Denny and Jack, plus Butch and Eddie, drum major of UGA’s Redcoat Marching Band. 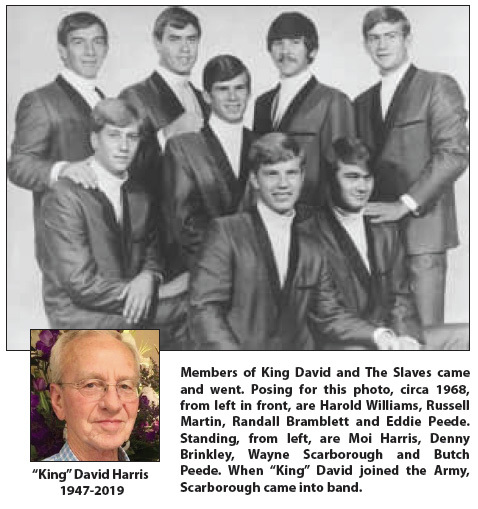 Eventually joining King David’s soulful band were Davis Causey, Harold Williams, Eddie Middleton and Scott Piotrowski. I am not a musician, but I love music, especially the genre played by King David and The Slaves. And I remember David as Randall does. Several weeks ago—in Jesup—David and I exchanged good-to-see-you pleasantries at Dr. Larry Bennett’s memorial service. Gripping my outstretched hand like vise-grip pliers, David’s mouth twitched, as he made a soft, wry comment. I could see the mischievous glint in his bespectacled eyes. We laughed and walked away. I had no idea that would be the last time that I would see my friend. And that rips a bigger hole in my soul.